White paper on crime 2001 Part 1/Chap.1/Sec.4/1. Fig. 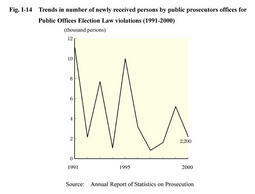 I-14 shows the trends in the number of persons newly received by public prosecutors offices over the last decade for Public Offices Election Law violations. The number of persons newly received for Public Offices Election Law violations sharply fluctuates depending on whether or not there have been any elections in the year in question and on the type of elections. The number was outstandingly high in 1991, 1993, 1995 and 1999 because unified local elections were held in April 1991, April 1995 and April 1999, and the general election for the House of Representatives was held in July 1993. In 2000, a general election for the House of Representatives was held in June, but the number of persons newly received was 2,200, fewer than 3,190 persons in 1996, when the previous general election for the House of Representatives was held. According to Criminal Statistics by National Police Agency, by nature of violation, among the number of persons referred for Public Offices Election Law violations in 2000, the most common were bribery and inducement of interests, followed by violations of documentation systems and door-to-door canvassing. Because bribery and inducement of interests have an extremely adverse effect on fairness in elections, the Public Offices Election Law sets forth various regulations on such acts. Since the Public Offices Election Law came into force in 1950, there have been significant changes in the election system under the law, including introduction of the proportional representation system for House of Councilors elections in 1982 and for House of Representatives elections in 1994. With respect to regulations on bribery and inducement of interests, the regulation holding a candidate jointly responsible was strengthened in 1954, 1962, 1981 and 1994 and the maximum amount of fines was raised in 1975 and 1994. Fig. I-15 shows the trends in the number of persons referred for bribery and inducement of interests at a point 3 months or 90 days after the voting day in nation-wide elections (general elections for the House of Representatives, ordinary elections for the House of Councilors and unified local elections) that were held during the period from the date of enforcement of the Public Offices Election Law until 2000, by type of election. 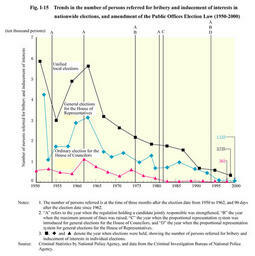 It also shows the year when the above legal amendments were implemented. The number of persons referred for bribery and inducement of interests started to decrease significantly since 1965 in all three types of elections. The numbers in general elections for the House of Representatives and in ordinary elections for the House of Councilors have been repeatedly increasing and decreasing in the short term, even immediately after the legal amendments for tightening regulations, while the number of persons referred in unified local elections, which has been the largest of all three types of elections, has been continuously decreasing. Since the above legal amendments became effective in December 1994, aiming at introducing the proportional representation system for general elections for the House of Representatives, strengthening the regulation holding a candidate jointly responsible and raising the maximum amount of fines, the number of persons referred for bribery and inducement of interests continued to decrease in elections that were held twice for each of three types of election.